Using DNA sequencing technologies to examine 147 melanomas originating from both sun-exposed and sun-shielded sites, a team of scientists at the Yale Cancer Center have characterized the mutational landscape of melanoma. The study revealed an excess of UV-induced mutations in sun-exposed melanomas. Most of these are passenger mutations that do not have a functional role in melanoma. “We devised a mathematical model to sort out the relevant DNA alterations from over 25,000 total mutations,” says lead author Michael Krauthammer, associate professor of pathology, who directed the bioinformatics effort of the study. 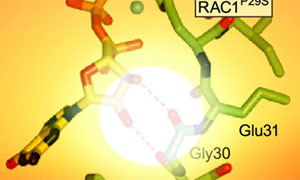 The analysis identified a frequent “gain-of-function” mutation in the RAC1 gene that has all the hallmarks of UV-damage. The study provided evidence that the mutant protein induces accelerated growth and movements among normal pigment cells, which are melanoma’s cells of origin. “It likely occurs at an early stage of tumor development and promotes malignant cell growth and spread to distant sites,” said corresponding author Ruth Halaban, senior research scientist at Yale School of Medicine and a member of Yale Cancer Center. Be the first to comment on "DNA Sequencing Technologies Help Characterized the Mutational Landscape of Melanoma"